Thought you couldn’t improve on an already mind blowing Rosé? Well, you might be wrong. Turns out there’s a lot of factors that go into making your Rosé taste as satisfying as it does, and they all happen after the winemaking process. 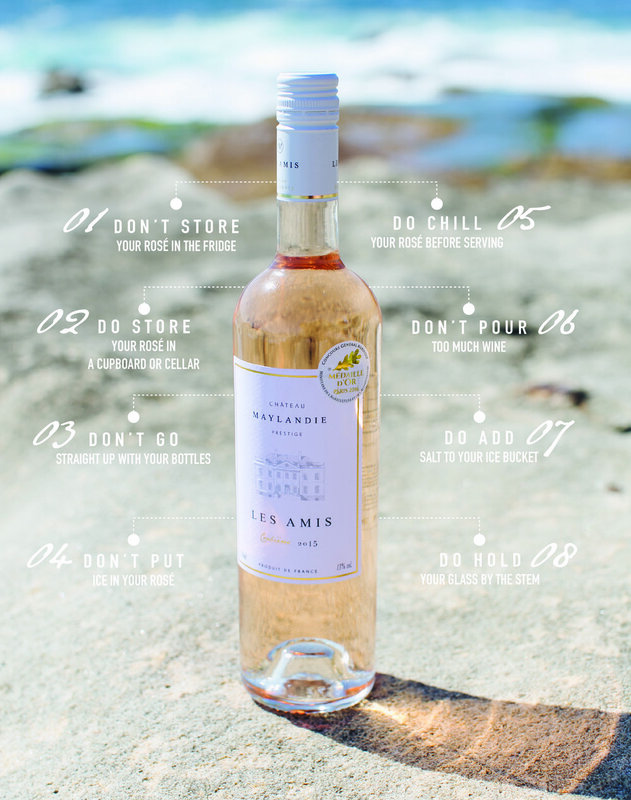 Take note of these important Dos and Don’ts when serving, drinking and storing your Rosé. While the taste of a good Rosé, like champagne and many other white wines, is enhanced when chilled these wines lose flavour and bouquet when kept in a refrigerator for too long. Avoid storing your Rosé in a refrigerator longer than five days. Look, it’s pretty obvious that some of us most likely don’t have cellars yet and that’s because your consumption probably exceeds your purchasing. That’s totally ok, but sometimes we all like to buy our wines in multiples, particularly when they’re on sale. When this happens, it’s a good idea to find somewhere cold and dry to store them, like a cupboard or an unused closet. Also, try to avoid placing them in high places like on the top shelf, because as science will have it, heat rises and this will cause the wine to mature too quickly and it just won’t keep. Storing your Rosé horizontally with a slight tilt upwards at the neck will keep the cork moist, which will then cause the cork to swell and prevent air and bacteria from entering the bottles. It’s a bit of a faux pas in the wine world but when it comes to the masses this isn’t a hard and fast rule. There are certainly times which call for ice in your Rosé (like heatwaves, Sangria, and when you’re trying to not get too boozed) but generally your Rosé, if it’s well chilled, shouldn’t need the addition of ice cubes as it will change the taste and balance of the wine. Ideally, Rosé should be chilled anywhere from 30 minutes to 3 hours in the refrigerator before you get down to business. Around 9 to 12 degrees is the ideal serving temperature. But hey, it’s Rosé, sometimes 30 minutes is just too long. Is it a glass half full or half empty? Either way, half-half is the way to go. Pouring wine like this will leave enough room in the glass for you to gently swirl the wine and release the bouquet. How annoying is it when you’re at a picnic, barbeque, anywhere without a fridge and all the ice in your ice bucket melts leaving you with room temperature Rosé. The worst. Here’s a trick: add salt to your ice bucket, it will increase the rate of chill. You can also twirl the bottle every so often to speed the rate of chill. Is this one a given? Probably. Hold your glass of pink plonk by the stem of the glass so as to avoid warming up the wine with your natural body temperature. It will keep your wine cooler for longer and your thirst quenched.